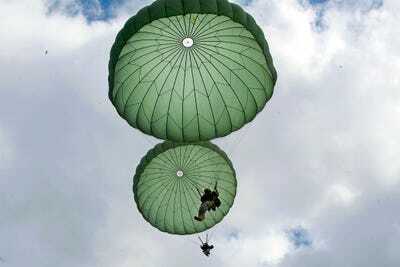 US paratroopers are some of the most daring members of the US military. After completing United States Army Airborne School, or Jump School, these volunteers are certified to conduct some of the most daring missions in the military. 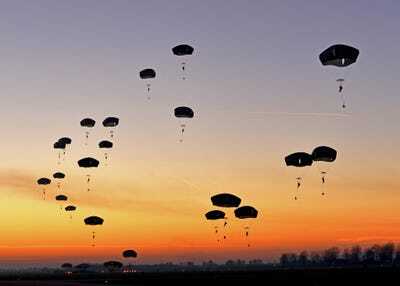 We have compiled some of our favourite images of US Army paratroopers below. 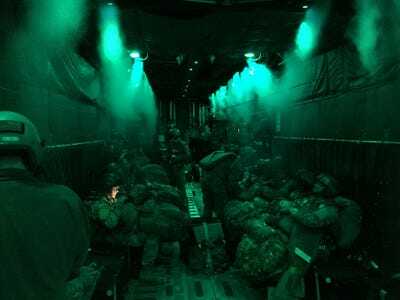 Paratroopers with 1st Brigade, 82nd Airborne Division (Advise and Assist), exit a C-130 aircraft Feb. 12, at Al Asad Airbase, Iraq, as part of the largest airborne training exercise conducted by U.S. forces in Iraq since the beginning of Operation Iraqi Freedom. 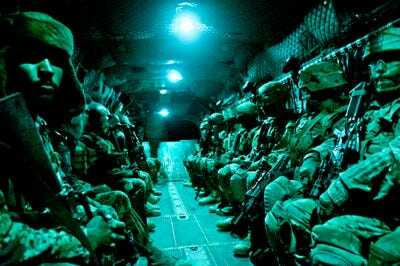 Paratroopers with the 82nd Airborne Division's 1st Brigade Combat Team and Afghan National Army soldiers with 6th Kandak, 203rd Corps, travel aboard a CH-47 Chinook heavy lift helicopter during an air assault mission May 4, 2012, Ghazni Province, Afghanistan. 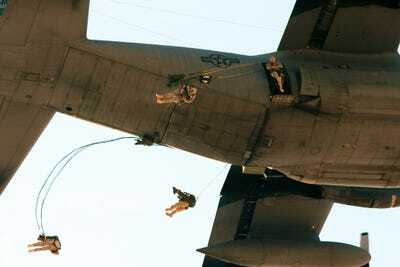 Paratroopers jump from a C-17 Globemaster III over Malamute Drop Zone, Tuesday, June 4, 2013. 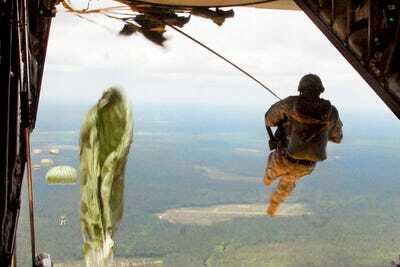 A US Army paratrooper from the 330th Transportation Brigade performs an airborne insertion from a C-17 Globemaster III cargo aircraft. British Colour Sgt. Christopher Wright (Far Right) gets ready to jump onto St. 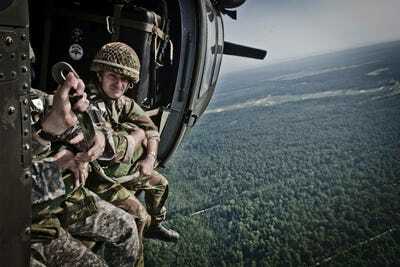 Mere Eglise drop zone from a UH-60 Black Hawk at Fort Bragg while training with US Army paratroopers. Staff Sgt. 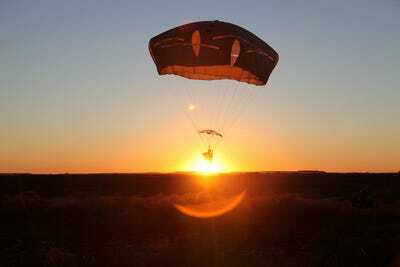 Travis Surber parachutes out of a C-130 Hercules Transport Aircraft and into the Ukraine sky. 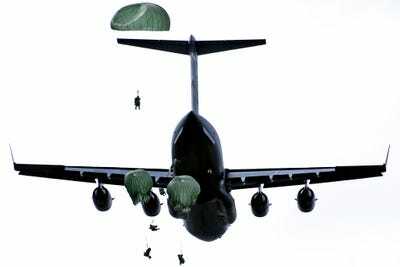 Paratroopers from 1st Batallion, 503rd Infantry Regiment and 173rd Airborne Brigade Combat Team, prepare to land after jumping from a C-130 Hercules . 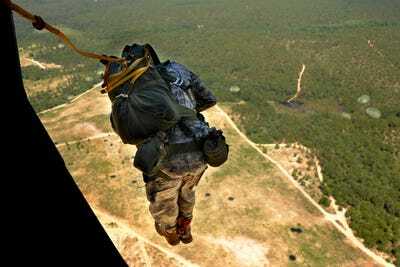 A paratrooper with the 95th Civil Affairs Brigade exits a UH60 Black Hawk helicopter Sept. 19, 2012, above White Lake near Elizabethtown, N.C.
A US Army Soldier leaps from the ramp of a C-130 aircraft during an airborne operation on Fort Bragg, North Carolina. 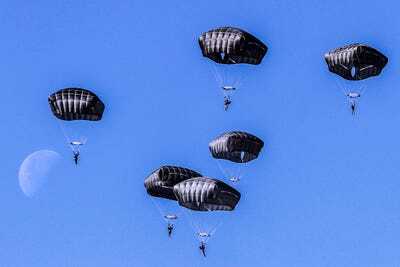 Paratroopers assigned to 3rd Brigade Combat Team, 82nd Airborne Division descend toward Holland Drop Zone against the backdrop of a crystal clear sky and last quarter moon during an airborne proficiency jump. 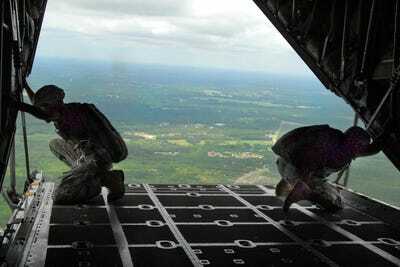 US Army paratroopers wait patiently aboard a C-130H Hercules for their time to jump. 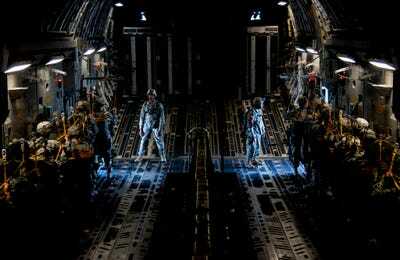 US Army paratroopers on a C-17 Globemaster III wait for the green light indicating it is time to jump. Paratroopers with 1st Brigade, 82nd Airborne Division (Advise and Assist), exit a C-130 over Iraq during a training exercise. 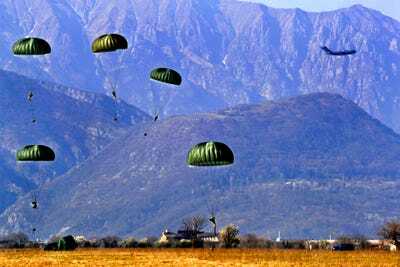 Members from the US Army 173rd Airborne Brigade Combat Team conducts combat jump operations from a C-17 Globemaster III during a joint coalition training exercise in Italy. 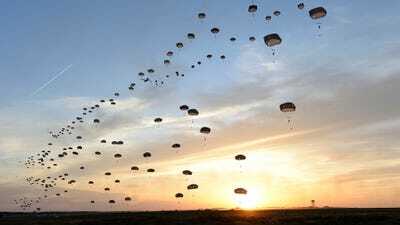 US Army and British paratroopers perform a static line jump at Holland Drop Zone in preparation for Combined Joint Operational Access Exercise 15-01 at Fort Bragg, North Carolina. 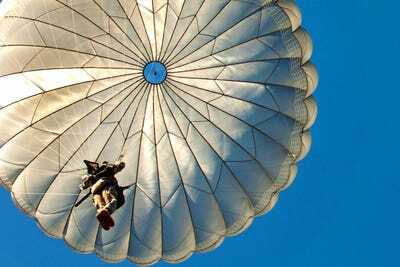 A US Army paratrooper, assigned to 1st Brigade Combat Team, 82nd Airborne Division, conducts airborne operations at Fort Hood, Texas.